Guarantee the safe arrival of your products with the premium materials found at Mahol Packaging. We supply businesses around the world with outstanding industrial shipping supplies at economical prices. Let us find the right solution to any of your specific needs or requirements, from tarpaulins for lumber to wraps for food. So many things go into safeguarding shipments so they arrive on time. Trust our protective products to get your cargo there in great condition. Mahol Packaging offers a full line of shipping materials for almost any industry. 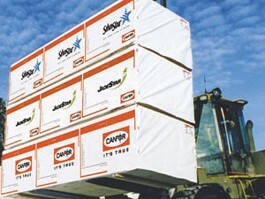 One of our main focuses is on lumber protection, including high-quality tarpaulins. When you contact us, you'll receive personalized advice on the best shipping solutions. From our headquarters in Harrison City, Pennsylvania, we sell packaging products across the world. Our customers always receive their orders on time and at competitive prices so you can meet your production requirements. Before starting our company, our founders worked for a domestic operation from Georgia. After it went out business, they decided to start selling the materials themselves. Now with 50 years of combined experience, we provide a wide range of products to suit a variety of budgets and needs.